I read recipes frequently enough that by now, I usually know immediately if I want to make the dish. Often I’m drawn in by a picture and I know visually, the dish will be stunning. Then there are the times where the ingredients sound so perfect together that I just can’t wait to dive in, often being able to taste the flavors just from my imagination. When I get both of these reactions to the same recipe, I’m on my way to the market as soon as possible for supplies. Recently, I read a recipe for pissaladiere and almost immediately found myself at the Whole Foods olive bar. 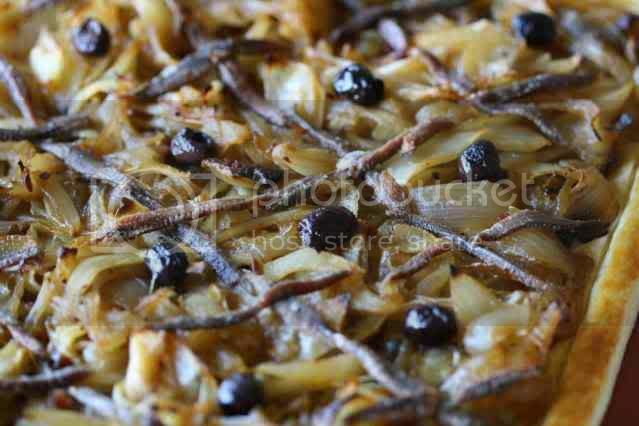 The technical definition of pissaladiere describes a pizza without cheese or tomato sauce, made up of sautéed onions, olives and anchovies. This dish dates back to the time of the Romans and while it may have originated as a pizza-like creation, it has since evolved into more of a tart. Of course, the star ingredients, olives, anchovies and sautéed onions, still come into play. The recipe I found used puff pastry as a base – one of my favorite starts to a tart, both for it’s simplicity of preparation and indulgent flavor. 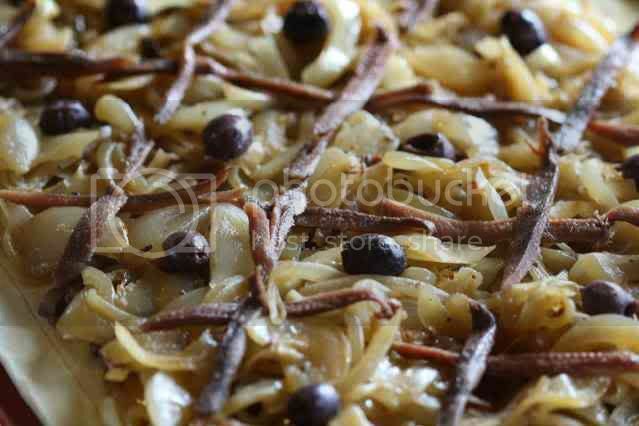 I knew the crisscross pattern of anchovies would make a beautiful photo and the sweet flavor of the caramelized onions would match beautifully with the salty, savory bite of the anchovies and olives. That salty sweet combination is habit forming in my house and true to form, the majority of the pissaladiere was inhaled within minutes of being cool enough to eat. I was concerned with overwhelming the boyfriend’s palate with too much anchovy so I used fewer filets than called for and cut them in half lengthwise. I had enough anchovies for the pattern on the tart, but was able to reduce the strength of their pungent flavor. It seemed perfectly balanced to me (an anchovy fan) and I would recommend taking this route to all but the most dedicated devotees. And by the way, if you don’t count yourself as a fan, try this recipe anyway with the smaller amount of anchovies. I think you’ll find you like the salty contrast. Peel onions, cut in half and slice thinly. Warm oil in a large, heavy sauté pan over medium low heat. Add onions, sun dried tomato paste, 1 T of vinegar, salt and sugar to the pan. Sauté until onions are tender and begin to caramelize, about an hour to an hour and 15 minutes. Only stir the onions every 10 minutes or so, just to keep them from sticking to the bottom of the pan. When finished cooking, taste the onions and add the additional 1 T vinegar, if desired. I did not desire. About 20 minutes before the onions are finished, preheat the oven to 400*. Place the thawed puff pastry on a baking sheet covered in parchment paper or a silpat. Score a 3/4 inch border around the pastry and chill for 10 minutes. Spread the tapenade over the puff pastry, inside the scored border. If your tapenade is chunky like mine was, the pastry won’t be fully covered. Just make sure it’s relatively evenly distributed and sprinkle with thyme leaves. When the onions are sufficiently caramelized spread them evenly over the tapenade. Drain anchovies and slice them in half lengthwise. Lay them over the onions in a crisscross pattern as shown in the picture above. Place one olive in the center of each diamond area created by the anchovies. Brush egg wash lightly over the border area. Bake the pissaladiere for 10 minutes, then reduce the heat to 350* and cook for an additional 10 – 15 minutes until the border is golden and flaky and the crust is cooked through. Scatter thyme sprigs over the tart if desired and let cool slightly before slicing. I don't make this often but pissaladiere is a personal favorite. The rest of my family can't deal with visible anchovies. Your recipe is outstanding. Another anchovy fan here! I always forget about pissaladiere, though. Have you made Bagna Cauda? This looks really great. I think traditionally the French and Italians would eat these baked fresh for breakfast. Yum! You were right - the pictures are gorgeous! What a beautiful presentation and picture! I'm still working my way up towards liking olives. I've gotten past hating them, but still don't quite love them. One day! That looks wonderful, and I'm drawn in by the pictures of a dish as well! I've been meaning to make something like this for a while now. Yours looks absolutely scrumptious! It has been to long since I have visited! This looks and sounds fabulous! I make a much simpler one with olive tapenade, cherry tomatoes, crumbled fresh goat's cheese and basil leaves. Must try yours! This looks perfectly gorgeous AND delicious! Always a winning combination. I need to try my hand at this one. Savour-Fare - Actually yes I have! That is a great way to use anchovies! Check it out in the sauce tab of A&B. Wow great job on the presentation. Mine never looks this nice as I just toss everything onto the dough. I love everything in this!!!!!! Exactly! When I am scraping the web for a recipe, I search with pictures. Then I know straight away whether the recipe shown is what I am after. Then reading the ingredients seals the deal. Pissaladiere has always been such a recipe.